If a full-sized solar pool cover doesn’t appeal to you, you have alternatives! 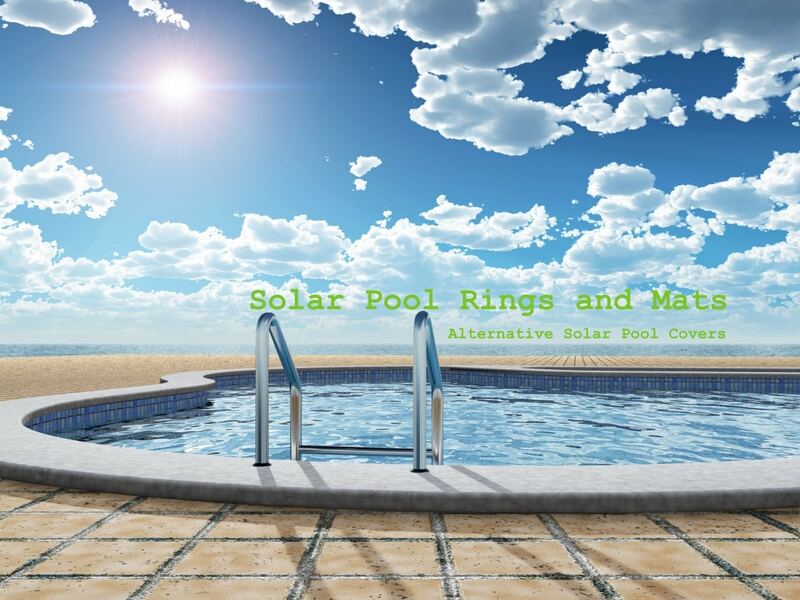 Solar pool rings and mats are a less expensive option for heating your pool. Plus, solar pool rings also act as insulation to prevent heat loss and evaporation overnight. They are also much easier to use and can be installed and removed by a single person. Solar pool rings or mats are circular (or square) pieces of U.V.-resistant vinyl. They have two layers, with an air pocket in between, for maximum insulation. You will need to inflate the air pockets in the rings upon purchasing them. These rings or mats function by focusing sunlight onto the surface of the pool for direct heating, as well as allowing sunlight to filter through for deep heating. The top layer is clear and contains the air pocket. This clear layer is what focuses sunlight into the air pocket and onto the lower blue layer. The blue layer then absorbs that sunlight and converts it to heat. The sunlight that is not absorbed by the blue layer passes down into the water for heating lower reaches of the pool. Solar pool rings usually have magnets around the edges. These help to hold the rings in place on the surface of the water. The magnets will readily detach if someone falls into the pool. This is a big advantage if you have small children or pets who could potentially fall in and become entangled in a solar pool blanket! But, these magnets may also serve another purpose. In some conditions, magnets have been anecdotally shown to reduce scaling in hard water. So your solar pool rings may also contribute to better clarity and water condition in a second way: by magnetizing your pool water. How Many Solar Pool Rings Do I Need? Manufacturers of solar pool rings recommend that you use enough rings to cover seventy to eighty percent of your pool’s surface. Since the individual pieces are usually between four and five feet in diameter, most pool owners will use around 12 to 20 rings or mats. The average price per ring is between $20-30. So, depending on your pool size, you can spend less on a set of solar pool rings than if you bought a solar pool blanket and the accompanying reel. Of course, you can always purchase enough rings to cover your entire pool for more heating capacity. One of the biggest advantages to solar pool rings is that they float to fill the shape of your pool. If you have an oval or kidney shaped pool, the rings will fill in those curvy spaces. You won’t have to deal with the hassle of trimming a large solar pool blanket. Also, if you prefer not to buy and set up the pool blanket reel, you can completely fill in your rectangular pool with square solar pool mats. Another advantage is their ease of use. You can place them in your pool and remove them by yourself with minimal effort. The rings can deflate and lay flat for storage, or they can be stacked against a convenient wall. The main disadvantage to using solar pool rings is that they won’t cover the entire pool surface. However, the rings have been shown to be just as effective as solar pool blankets in retaining heat and preventing evaporation. There is usually only a small amount of space left between the rings. Still, leaves and other debris can potentially enter the water through these small openings. A regular removal of debris will still be necessary if you use solar pool rings. If you’re in the market for an alternative solar pool cover, you’ve come to the right place. Here at Daniel’s Home For Solar Energy, we’ve found the best options for solar pool rings and mats. Check out our product recommendations!